Ex-Leicester prop Martin Castrogiovanni is under investigation following his amazing five-minute rant to reporters. The Italian singled out Tigers coach Richard Cockerill for criticism after Toulon's European Champions Cup defeat at Welford Road. Team-mate Delon Armitage is also under scrutiny over claims the full-back used offensive words in front of fans. European Professional Club Rugby is considering whether to bring misconduct complaints. In a statement, EPCR said: "The Disciplinary Officer has requested information from Leicester Tigers and the two players, and will also review all other available evidence before deciding what the next steps, if any, will be. "The first incident concerns allegations that during the match the RC Toulon player, Delon Armitage, used offensive language at or near spectators. 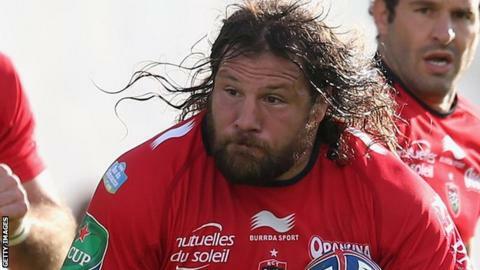 "The second incident concerns allegations that when addressing representatives of the media after the match, the RC Toulon player, Martin Castrogiovanni, criticised the Leicester Tigers Director of Rugby, Richard Cockerill, and used offensive language in doing so. "Should the Disciplinary Officer decide that there are grounds to bring a misconduct complaint in respect of one or both of the incidents, the case or cases would be heard by an independent Disciplinary Committee under the Disciplinary Rules. "In the meantime, both players are free to play." Castrogiovanni was upset with the Tigers for claiming he left in 2013 for a pay rise. Using a number of swear words during his post-match outburst he told reporters: "It was made to look like I had left the club for the money. "Cockers talks about the money, but I paid £100,000 from my own pocket to leave this club because I want to play rugby. "I always love this club and I wanted to clarify and talk face to face, which is something Cockers never does. I didn't have an opportunity to defend myself when I left. I never want to speak with Cockers any more." A crowd favourite during his seven years at Welford Road, Castrogiovanni left the Tigers last May before joining Toulon. "I am the kind of guy that if I hate you, I will say it to your face and I will never speak to you again," he added. Reacting to Castrogiovanni's outburst, Cockerill said: "Castro is a fantastic icon for this club and I have nothing but praise for him. "I don't want him to feel bitter towards us. I certainly don't feel bitter towards him. One day we will have a beer and we will smile about it."